At St Christopher’s we are keen to examine our approaches to LGBT diversity, both within our hospice and the community, and are appealing for help from our local LGBT communities. We want to create a group of friends who will be able to offer us advice and support around LGBT issues in South London and to help develop our diversity agenda. Research by Stonewall/ Marie Curie and from the Cicely Saunders Institute has highlighted that the LGBT community face inequalities in all areas of access to healthcare. It is our aim to ensure that as an organisation we work towards overcoming barriers to access end of life care. 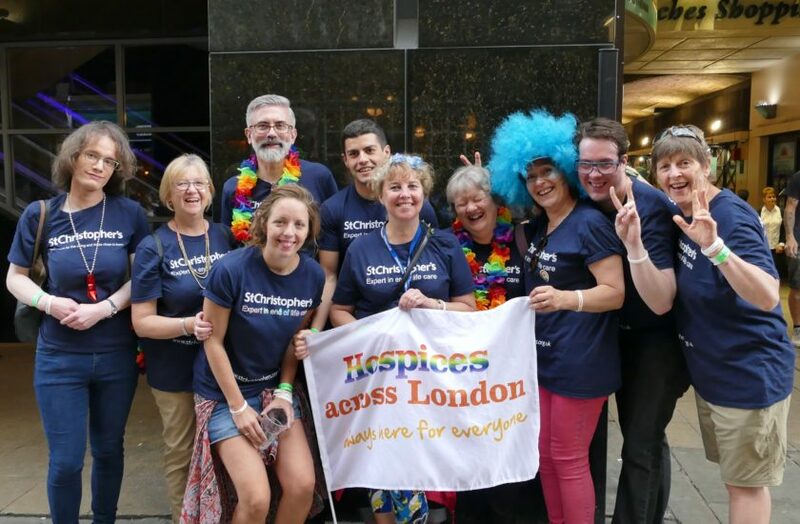 One of our care values at St Christopher’s is to be ‘of and for the whole community’ and this year we were proud to march at Pride for the first time. We hope our newly created LGBT friends group will help us understand the needs of our local LGBT communities, the expectations which these groups have of hospice care, the approach to end of life care that members of the LGBT community would wish us to take and to know better how informal support can be offered to LGBT people, their family members and friends. We also want to examine the ways in which our bereavement services may be tailored to be responsive and aware of any specific issues for bereaved lesbian, gay men, bisexuals and trans people.